Alden Bridge Presbyterian Preschool is a non-profit ministry of Alden Bridge Presbyterian Church. Our purpose is to provide a safe and nurturing environment in which children can grow. We believe this environment promotes the spiritual, social, emotional, physical and cognitive development of the young child. ABPP is open to children of all faiths. ABPP serves children by teaching them through a developmentally appropriate curriculum. According to Piaget’s Theory of Cognitive Development, children progress through age-related developmental stages. Our curriculum is implemented to meet the diverse needs, interests and developmental levels of each child. Play is an essential part of the curriculum. Play that is child-initiated, child directed and teacher-supported is an essential component of developmentally appropriate practices (NAEYC, 1987). 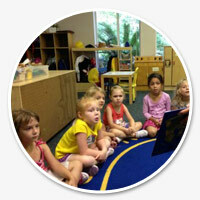 Children will learn skills through repetition in songs, fingerplays, stories, and dramatic play. Curiosity and problem solving skills are enhanced with the chance to ask questions and look for answers to problems presented in the classroom. Each year children are given the chance to build on the skills they have with concrete materials, and experience their world through sensory experiences. The spiritual development of the child is by no means less important than the aforementioned areas of development. As educators of young children it is our challenge to provide Christian answers to life’s questions through building a foundation of faith in our Creator. This is accomplished by implementing a curriculum that includes Chapel time, bible stories, verses, and songs. By using this style of education, children will be affirmed of their worth, explore the meaning of life together, marvel at creation, rejoice in the changing of seasons and begin to accept the values of love, kindness, joy, patience, fairness, thankfulness, and obedience. It is our prayer that your child will discover God’s love through his/her experiences at Alden Bridge Presbyterian Preschool. Amanda's greatest passion is the teaching and guiding of children by establishing a love for learning and witnessing Christ through the care of children and their parents. In union with Alden Bridge Presbyterian Church, her mission is to share the joy of loving and serving God the Father, the Son and the Holy Spirit, thereby increasing family life within the Alden Bridge Presbyterian preschool and community. She currently holds a B.S. degree in Social Sciences with a minor in Psychology and has over twelve years of experience in Early Childhood Education. Amanda also holds a Texas Child Care Director's license, and is a member of the National Association for the Education of Young Children, the Southern Early Childhood Association, the Texas Association for the Education of Young Children, CPR/First Aid Certified and is currently studying for her Master of Education in Educational Leadership and Instruction. Hannah has been at ABPP as a parent since moving to The Woodlands in 2013, and joined the staff in 2014. Hannah is originally from Little Rock, AR, and is married with 3 children. Hannah has a B.A. from American University in Washington, D.C., and a J.D. from Tulane University in New Orleans.